Traditional American and Celtic instrumentals; Old-Time jigs, reels, and waltzes played on banjo, flute, fife, guitar, mandolin and cittern. Traditional Old-Time and Celtic instrumentals played on banjo, flute, fife, guitar, mandolin, and cittern. Jigs, reels, and waltzes guaranteed to get your feet moving. Good for listening, dancing, driving, and playing along. If you like music of the 1800s as it was played in 1975, you'll love this Iowa band! Scott Ross on banjo and cittern; Jeanne Witt on flute, fife, and mandolin; Jorgen Briggs on guitar. This CD is well named -- the only better name might be Almost Twenty Toe-Tappin' Tunes -- because that's what ya get. There are all-time favorites like "Solider's Joy", "Flop-eared Mule", "St. Anne's Reel", "Turkey in the Straw" and "Barlow Knife" and then there are great old tunes you might have heard less frequently but always wanted to learn like "Jubilo", "Walk Old Shoe", and "Colored Aristocracy" and finally there are lesser known, aleit catchy, melodies like "Sally in the Garden", "Southwind" or "Rock the Cradle Joe". All seventeen cuts are rendered with a pleasing mix of fife (flute), mandolin (or citten), banjo, and guitar by five very capable musicans with a fine sense of tempo and timing for old tyme and celtic music. This is a very enjoyable CD -- I put it on just to listen but end up getting done a mandolin to play along every time. I usually listen to classic rock so this is a nice change of pace. This CD really delivers a terrific blend of old-time and cletic music. The instrumentation on each song varies so you never tire of the traditional material presented with rich celtic flavoring. 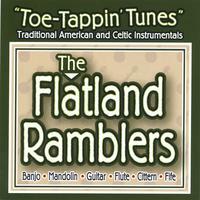 The Flatland Ramblers are the real deal! I live in Ames and heard about your group performing at the downtown festival and was wondering if there is any place in downtown Ames that sells your wonderful CD?